There's a lot of sand in Australia. There's big deserts in the middle, and beaches around the outside. Because of all the sand, some humans, including politicians, have mistaken Australia for a litter box. I want more "green tape". It sounds like something fun to play with. Endless green tape! I want it so hard to damage the environment that companies don't bother, they find ways to do things without causing harm instead. 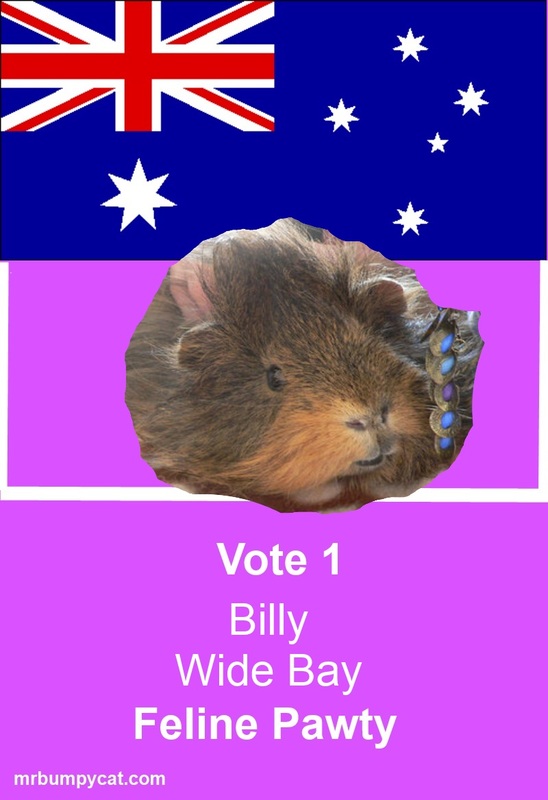 So, I've decided to make Billy, the Feline Pawty Candidate for Wide Bay, the Environment Minispurr when we win the election. Billy thinks the way I do, he wants to save the planet. That's a big job for a little guinea pig, but I know Billy can do it. He'll do a better job than a lot of the human politicians are doing now, anyway. They have a lot of strange ideas. Some of them are saying we need nuclear power, and that will help the environment. I've checked with the cats at Fukushima and Chernobyl, and they say that's not really a good idea. If only we had access to sunlight or wind or some other source of power that we didn't have to dig out of the ground! Some of our politicians really love to dig things out of the ground. They just love digging. Here, in Queensland, the premier has a real love of holes in the ground. He likes mines, and tunnels. Even when he was Brisbane mayor, he was digging tunnels. Maybe he's wombat. That would explain why he loves digging tunnels. I'll have to find that out. Cats aren't that fond of digging, at least, not any deeper than we dig in our littler trays. But green tape? I'd love a nice big ball of green tape to play with. Feline Pawty Prime Minispurrrial Candidate. 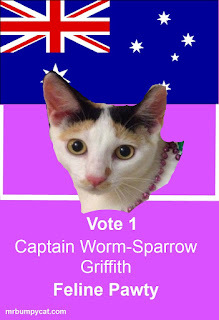 I'm sure you've heard about the Feline Pawty's bid for the federal election. 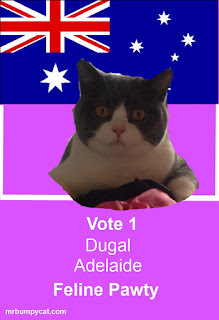 I've been trying to find the best job for my friend Dugal, the candidate for Adelaide in our new government. He's a big strong cat, with a really big, strong paw. I'd been thinking of making him Deputy Prime Minispurr, but I think I've found something even more important. I think I should make him Speakpurr of the Parliament. That's a job that needs are really, really, strong paw. One of the things I've been doing lately to learn about politics is to watch Parliament Question Time on television. You might expect that the Parliament that runs a country as big as Australia would be doing important things, working together to try to make the best decisions for all Australians. You would be wrong. Have you ever watched two dogs who have been introduced to each other and have to share a yard? They have a weeing contest. They wee all over the place, each trying to have the last and strongest smell. That's what the humans in Parliament are like. They're not trying to work together to fix problems and come up with great ideas. When ever someone comes up with an idea, the other side just wees all over it. No wonder nothing ever seems to get done. The toughest job in the Parliament is the job of the Speakpurr. 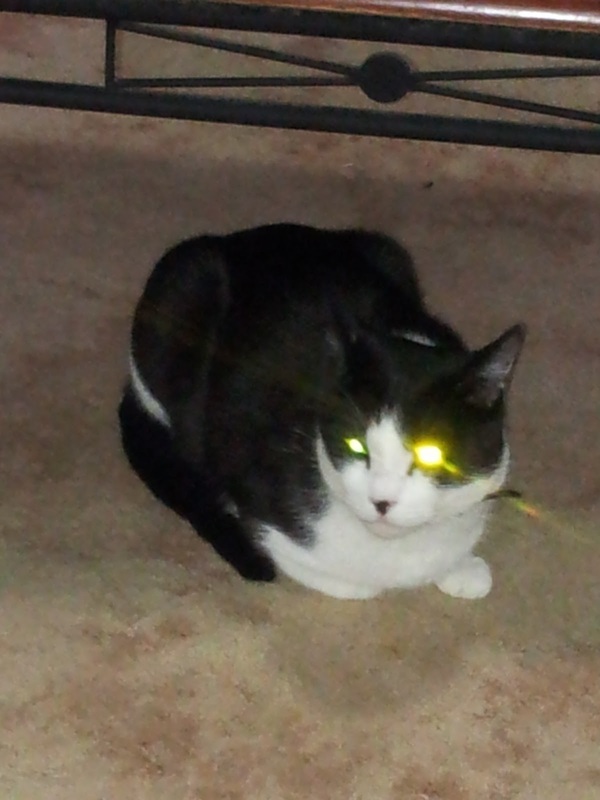 The Speakpurr has to try to make all the unrefined, misbehaving, humans, be more civilised. I've watched the current Speakpurr, Ms Burke, on TV, trying to make the humans behave with some dignity. She keeps having to tell them they're bad humans and even sends them outside for time out. She works very hard, and the humans don't show her a lot of respect. Sometimes, they won't go when she sends them to time out and she has to get someone to take them out. They never behave well enough for her to give them treats. So I think the job of Speakpurr needs a bit strong cat, with big strong paws, like Dugal. Parliament will be in safe paws with Dugal, I think. The Feline Pawty Candidate for Lingiari, Northern Territory, is Loupi. 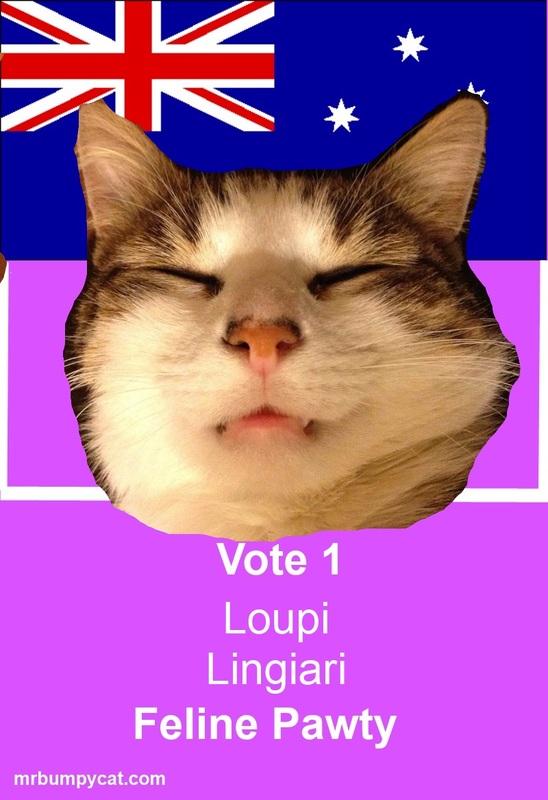 Like a number of human politicians, such as the Queensland Premier, Loupi lives outside the electorate he's candidating for. 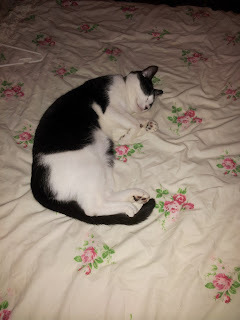 If you want to know more about him, you can read his blog (you may need the translate button) Swiss Cat's Ideas. The Feline Pawty Candidate for Blair (Qld) is honorary cat Thomas. 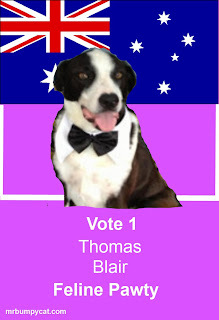 If you live in Blair and would like to know more about your candidate, you can find him @PuppyNumber7 on Twitter. The latest force in Australian politics is creating history with everything it does. Last night, the Feline Pawty announced the first six non-human candidates for an Australian Federal Election. Party Leader, and candidate for Lilley, Mr Bumpy said he had hopes of fielding candidates in all 150 electorates, and having been able to endorse six candidates in the first night of preselection was an excellent start. 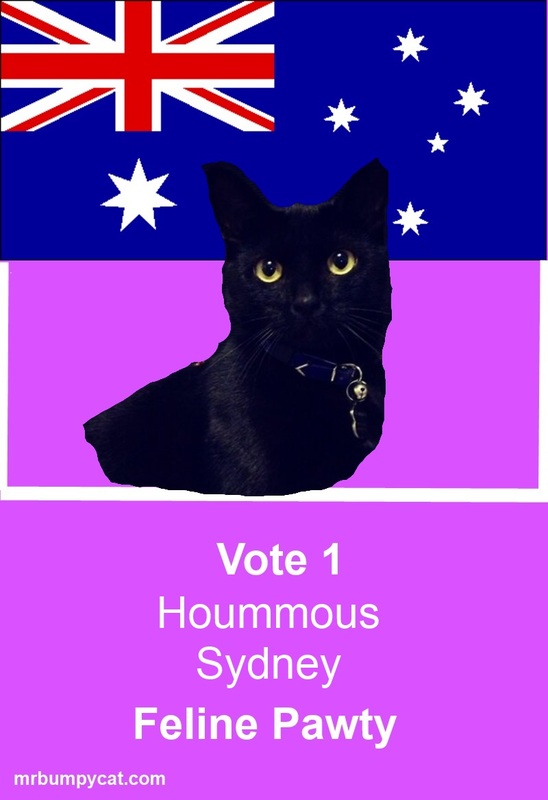 He said he was sure there were enough cats and honorary cats (other non-humans who support cat-related issues) in Australia who felt strongly about feline issues to be able to field a set of strong candidates with a good chance of winning the election and making him Prime Minispurr. 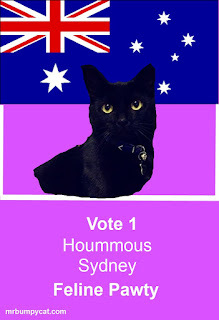 "One of the unique things about the Feline Pawty, is that our candidates are free to develop their own policies as well, as long as they agree to support the Pawty's primary policies." Mr Bumpy said. "We're not afraid to spell out our policies up-front, not like certain human politicians who say they'll have policies about anything and everything, but really seem to just have a policy of not having a policy." 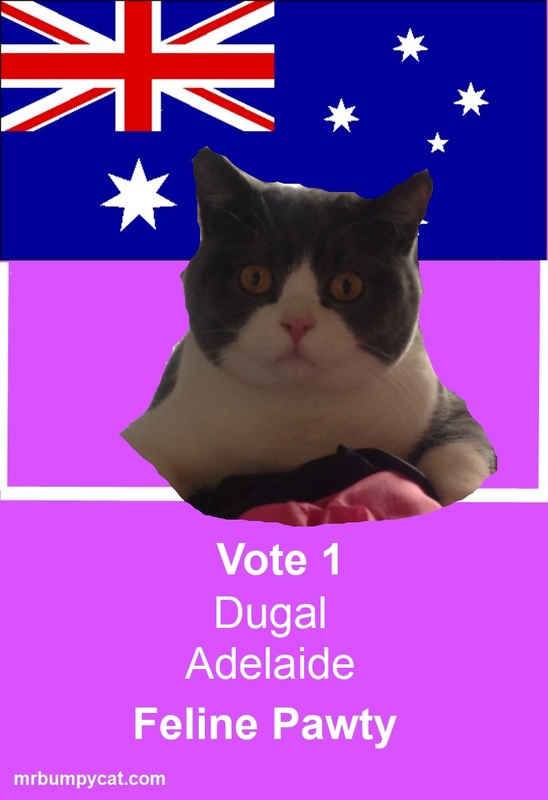 The Feline Pawty's Candidate for Adelaide, South Australia, is Dugal. Dugal's very keen on the Feline Pawty's free catnip policy. 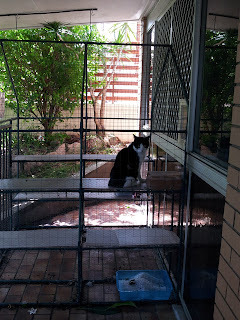 If you want to find out more about Dugal, his blog is Three Aussie Cats. 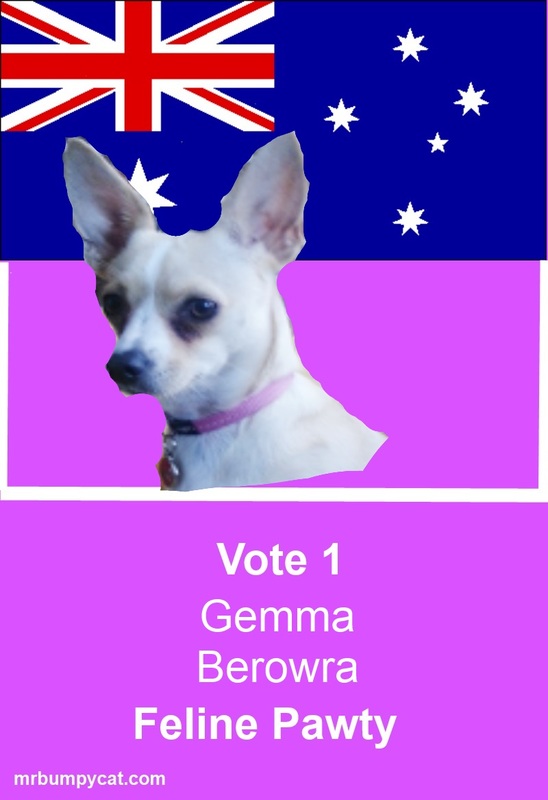 The Feline Pawty's candidate for Berowra in New South Wales is Gemma. You may notice Gemma's not strictly speaking feline. 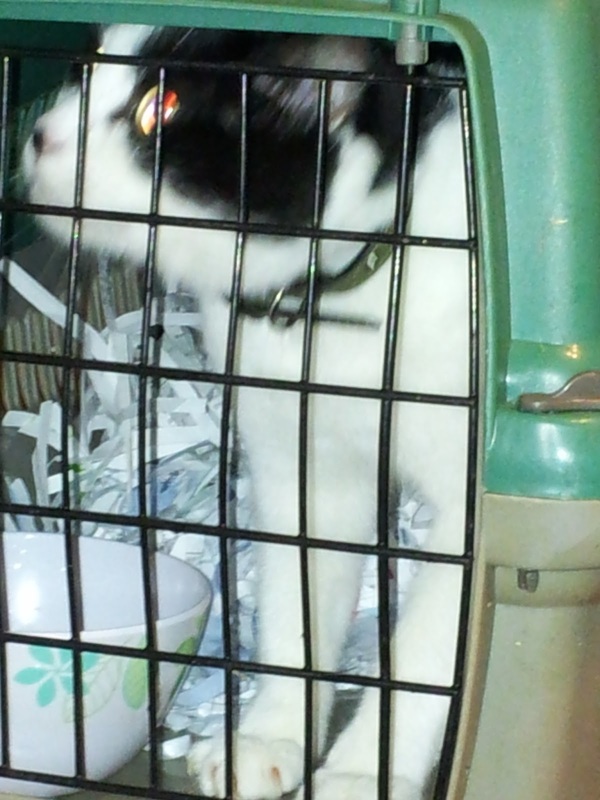 The Feline Pawty also has members who are "honorary cats". 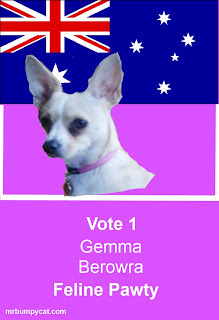 If you would like to know more about Gemma, you can read her blog, Gemma's Little Gems. 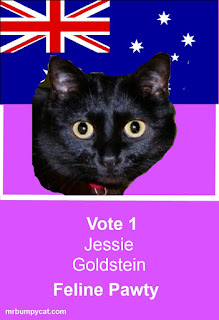 This is Jessie, the Feline Pawty's candidate for Goldstein in Victoria. This seat is presently held by Liberal Party's Mr Andrew Robb. According to Jessie, the seat is " ... a very very blue blood electorate that needs a lot of cat sense to get it back into order! (over-run with mice)." If you're in the area and want to know more about your candidate, you can find her blog here. 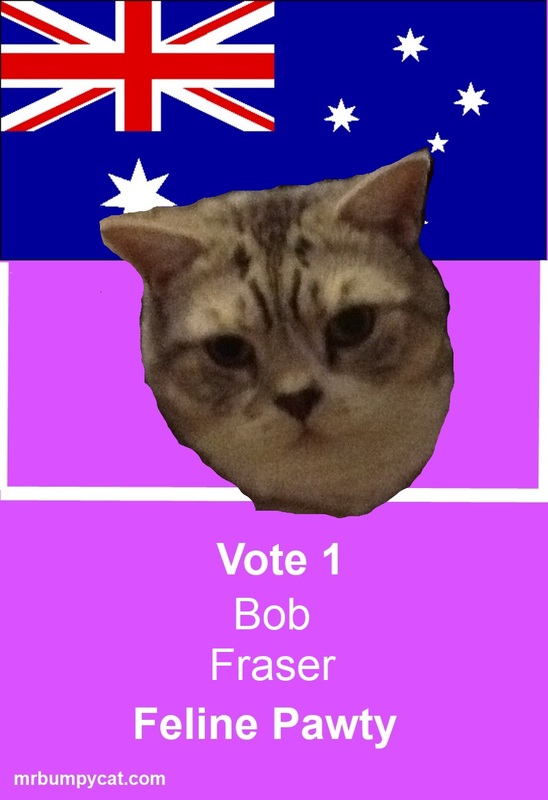 It's time to preselect candidates for the Feline Pawty for the federal election. So, all my Australian Minions, I'd like you to send me your profiles. 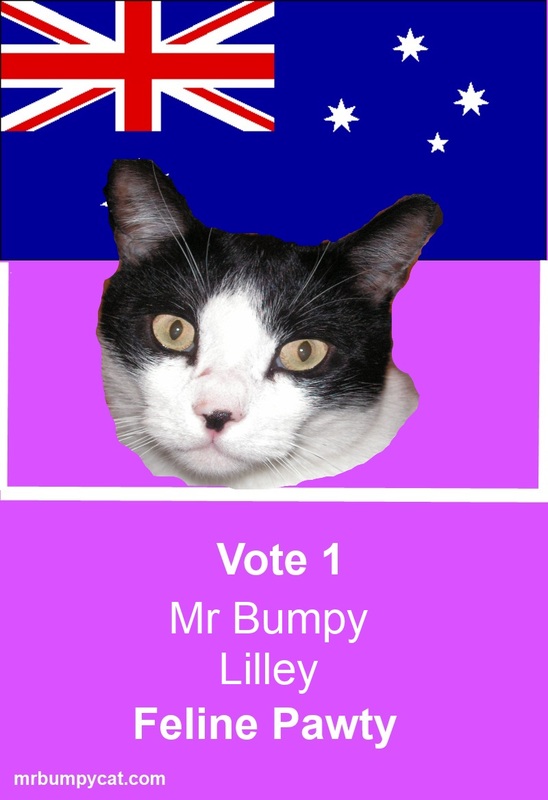 Please send this to me as soon as possible, at contact@mrbumpycat.com, and I'll make your electoral poster. Here's mine, so you can see what yours will look like. I'm running for the seat of Lilley, in Queensland. It's the seat currently held by the treasurer Mr Swan. 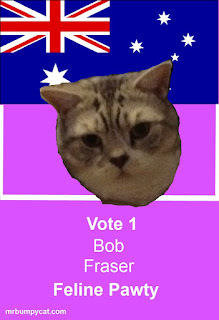 Come on Aussiecats, let's see if we can have a candidate in every electorate. The first of my election campaign posters - Mr Bumpy. I'm sure you've heard by now that Ms Gillard has called the election for the 14th of September. 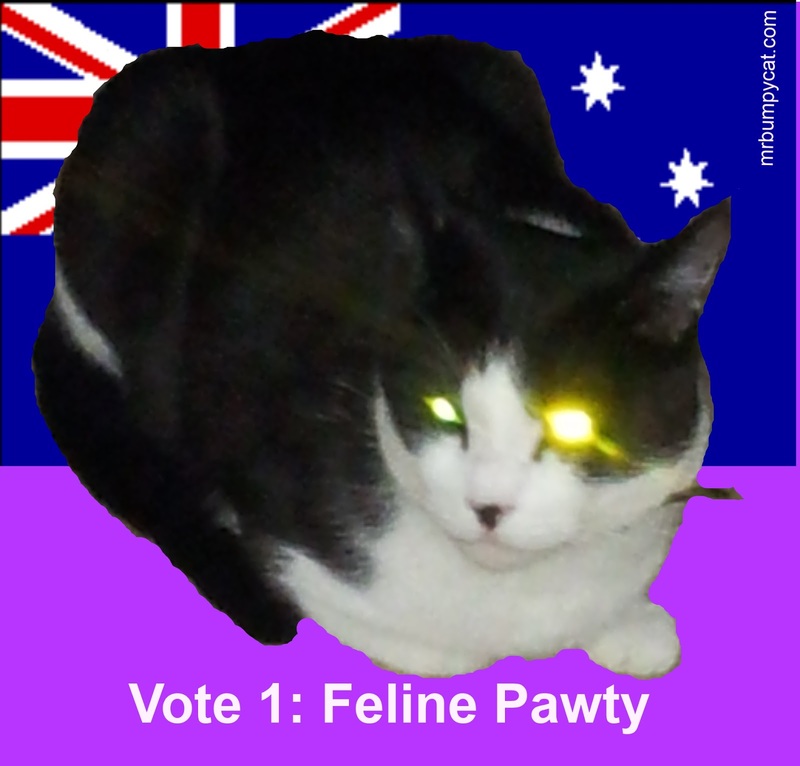 She's given us a lot more notice than Prime Minispurrs usually do, but that's to be fair to the new force in Australian Politics - Mr Bumpy's Feline Pawty. Most people haven't heard of us yet, so we need a long campaign time. Of course, I'm the face of the pawty, because I'm going to be Prime Minispurr. So that decision was easy. 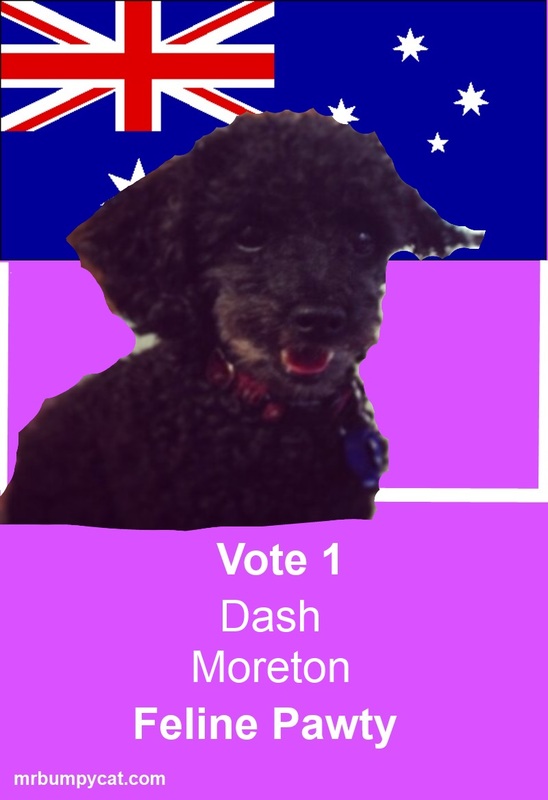 The big, important decision I had to make to start the campaign was, what colour would my pawty be? After much consideration, and many naps, I finally decided to make my pawty's colour purple. I chose purple, because it's a nice colour and I look good against a purple background. Don't you think so? Well, that's all the important work done. A note to my minions - please print out copies of my poster and put them up everywhere. We need maximum coverage. I don't know if you realise how much work is involved in being a cat on the night shift. It's quite amazing how unappreciated I find myself when I do a hard shift of night work. For example, Mr Woof sleeps most of the night, but if around 1am he wakes Mum and says he needs to go out for a wee, Mum calls him a "good dog" and takes him out. If I've been active the whole night, and wake Mum and ask for a little something to snack on, she calls me a "bad cat" and tells me to go to bed. Humans just don't understand how hard a cat works during the night. In one night, I can kill a dangerous magazine and bathmat, rearrange the linen shelves, and thoroughly investigate several bags and boxes. You have no idea what disasters would result if I didn't do this incredibly important work. Humans, if you belong to a cat who is doing night duty, show him some respect. Everyone's safety depends on him, and he works very hard to fulfil his responsibility. and I are enjoying our new house. Did you know I got a housewarming present? I was the only one who got one, and it came all the way from America. That's because I'm more loved than anyone else. The day we were going to move, there was a big storm. Mum said something about a cyclone that had crossed the coast and become a low pressure zone or some such thing, that to me seemed to say she didn't really know anything about it. But anyway, the storm was very, very bad in some parts of Brisbane, Mum says in lots of parts of the state, not just our city, but really, how big can one storm be? Well, there was flooding after the storm as well, and the removalists called Mum and said they couldn't come because their truck was stuck, and they'd come the next day instead. 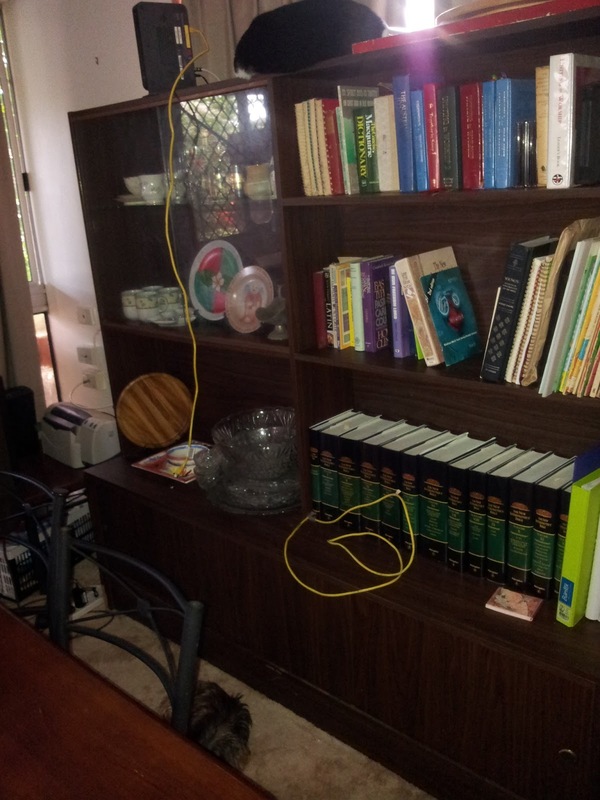 Well, Mum and Mr 18, moved some of the boxes and things that day, to make the big move faster the next day, and they had a bright idea. Mr 18 and I would sleep in the new place, so I could be safely in my fortress when the removalists arrived the next morning and the strangers wouldn't bother me. Mr 18 and I slept in the lounge room, with a sleeping bag and a pillow. me a yummy housewarming gift. We were woken next morning by someone at the door. It wasn't Mum and the removalists. It was a delivery man. He said he had a parcel for Mr Bumpy. Mr 18 was only half awake and was confused, because I don't normally get parcels. He picked me up and said, "This is Mr Bumpy." The delivery man looked at me and at Mr 18 and said Mr 18 would have to sign for me. Apparently, Australia Post does not accept paw prints as proof of delivery. I can't imagine why that would be. Mr 18 didn't help me open my parcel, he just looked strangely at it until Mum got there. and took his cat treats. I let Mr Woof share some of the treats, and he agreed they were very good, even though they were catnip treats. I really enjoyed my housewarming present, and there's still some left. Mum sometimes puts some out in my fortress so I can enjoy them while I watch the world going past. It really is a good life. But I have a very important question. Those treats are Temptations. We get Temptations here in Australia, in fishy flavours, and meat flavours. So why don't we get catnip flavour Temptations here the same as they do in America? 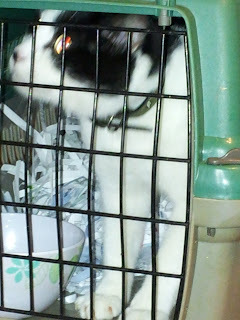 Must cats be reduced to trying to sneak treats past Customs any time we want to nibble a bit of a nip flavoured treat? Who makes Temptations? Maybe I should ask them. Maybe we could take up a petition. Anyway, I'm heading out to my fortress to watch the world go by, and maybe nibble on a treat. I think Mum put some out there. "But don't you love me anymore?" It was a traumatic experience. First of all, I was put in the cat box. I hate the cat box. My humans love me. Why would they do that to me? Then we came to the new house. The first thing I noticed about the new house was that there were noises in the roof. They were loud, scary noises. It was like possums in the roof, but much, much louder. I thought it was giant possums. I was a bit scared when I heard the giant possums. Then I saw what it was. We have four humans, two regular sized humans and two small ones, and a black dog living in our roof - right up in our roof, really. 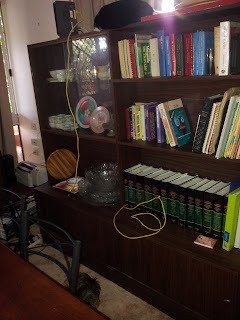 The small humans took Mr Woof up there when the removalists came with our stuff. He says there's a whole house up there - in our roof! Who would have thought that was possible? I still get a bit spooked when I hear the noises and then I remember it's not giant possums, it's humans and a black dog named Nelson. "I quite like my fortress of doom." There is something I do rather like about our new home. I have my very own cat door, which I can go in and out any time I like. It leads to a special place that's just for me. 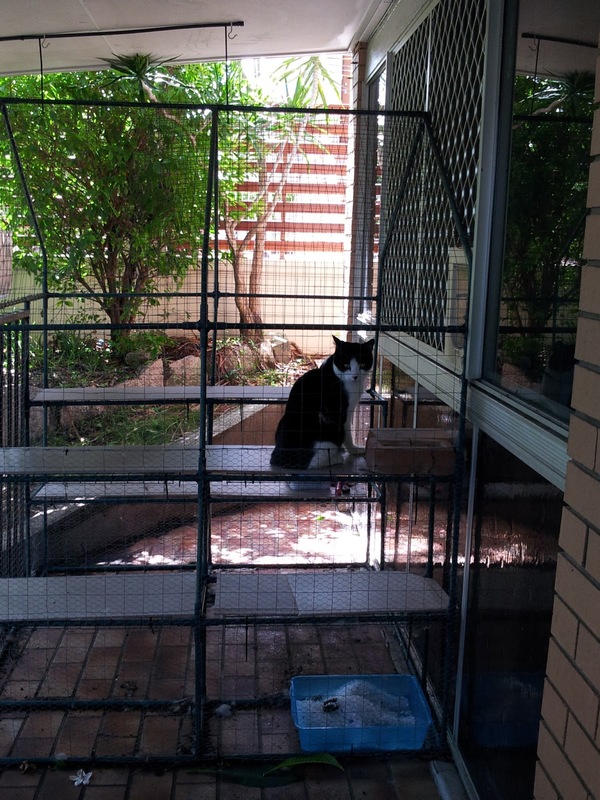 Mum called it a cat cage, but Mr 18 corrected her. I'm the Supreme Feline Overlord, so this is obviously my Fortress of Doom. A Feline Overlord needs a Fortress of Doom. I can watch the whole world go past and nothing can get in here. Mum says she's going to put a catnip plant in here for me as well, which will make it even better. I did decide to leave a couple of times, and shot out the front door when Mum was taking Mr Woof out for his wee, but usually I'm happy to hang out in my Fortress and watch the world, and know I'm safe from everything. Well, as you can expect, I'm very busy establishing my control over this new household. I don't want the humans getting any odd ideas about being in charge or anything like that.